BaitRageous: Deer on the Patio! I awoke this morning and flung open the door to look out over my big backyard. 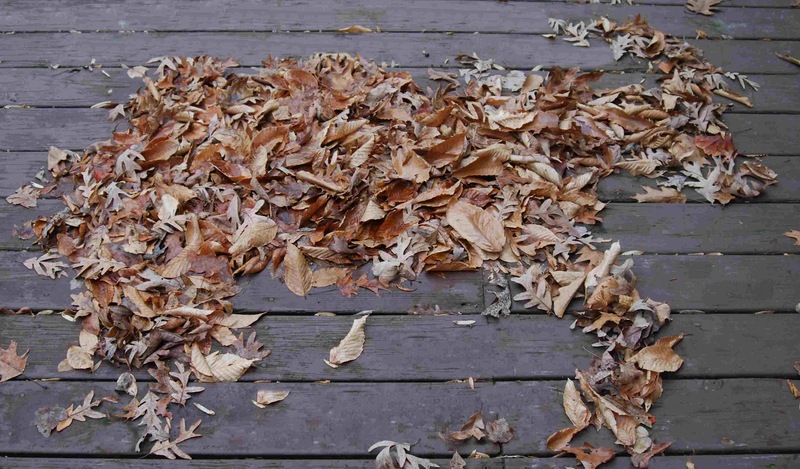 To my amazement I saw a most peculiar sight out on our patio floor. It wasn’t Santa or his elves, but I think it was one of his big brown reindeer. Just as I got a picture, as you can see from here, a powerful wind blew up and the reindeer disappeared. Ok that’s it for my poetry. 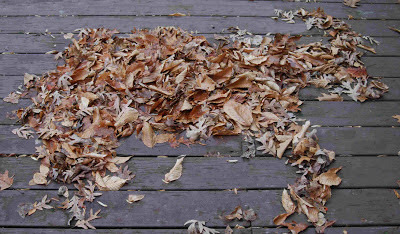 Actually, the other day I looked out the window and saw this pattern of leafs. They naturally fell to form an image of a reindeer. How appropriate for the season. Remember: "Life is short, get away from the big screen and get on a big stream. Yep, Shoreman and I hope I don't see any other images in the leaves etc..